Written by Lars-Erik_Olson on January 31, 2003 to Exclusive. “It’s something that the efficient ears on the Daily Roxette spotted some time ago,” credits Gessle’s manager, Marie Dimberg. A Daily Roxette discussion topic, started by TDR reader “jobarth,” pointed out the similarities. Malmstedt’s accusations against Per Gessle at the English court finally came to an end yesterday when yet another judge dismissed Malmstedt’s claim for appeal. “This is not over, there are other ways,” Malmstedt commented. 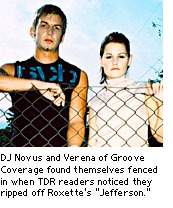 yeah - groove coverage bought to justice!!!!!! the ’other ways...’ comment from Stephen scares me a bit! When are the men in white going to take him away?!? lol, Gessle rules the world! Well... it feels nice to get this kinda of news. Justice. and that brat sings even worse than my cat when i step on ’er tail!!!!! You rule, Per! :-) Grattis! Wouldn’t it have been better if Per would have let this Song just be a “Groove Coverage”-Song? I mean, everybody knows that the melodies in Jefferson-Bridge and GIAG-chorus are the same. And everyone knows that “Jefferson” was the first song and that it is Gessle’s melody. I thought he would have been “wise” enough to just let it be like it is. I think that musicians should tolerate things like this. At least in cases like this when it is obvious. If Per was an unknown artist and his song would have been stolen and became a hit, situation would be different. Unfortunately, I can´t share your opinion. Roxette fans and people who bought “Room Service” knows about “Jefferson” and it´s chorus, or better said “bridge”. But there are even more people who knows “God is a girl”, because it´s a Club-Hit and it really did well in the sales charts. I wouldn´t have said anything if Groove Coverage changed the chorus just a little bit. But they took it almost 1:1 for their own track. I think, if Groove Coverage asked Per before producing the song and mentioned “Per Gessle” or “Jefferson” in their booklet, there wouldn´t be any problem.